I'm making triples of mittens, rather than pairs, in case one is lost. Is this silly? Do kids lose mittens? My kid doesn't seem to, but I don't know if he's representative. Perhaps if they lose mittens they'd lose both of them rather than just one? 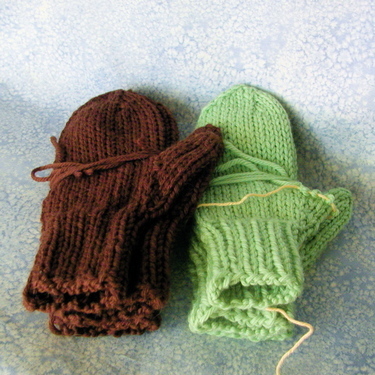 I'm waiting for more yarn to come in, both triples are missing one thumb each. Hopefully the difference in dye lot won't matter too much. All are for Max's school fair. Does anyone have a child who is really interested in astronomy? I have a book to give away, it's a picture book put out by NASA called "Hubble 2006 Science Year in Review." It has lots of pretty glossy photos from the Hubble Space Telescope with explanations of the science. And there's a poster to go along too! Let me know if you want this, and if there's a lot of interest I'll pick a number. Not a political animal, this blue dog just is. 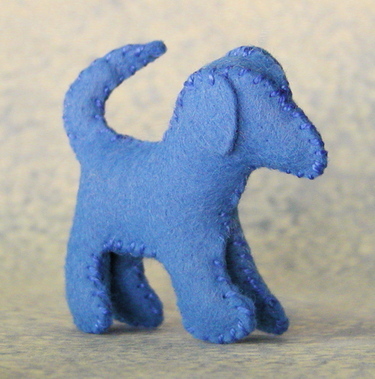 A kind of zen blue dog. 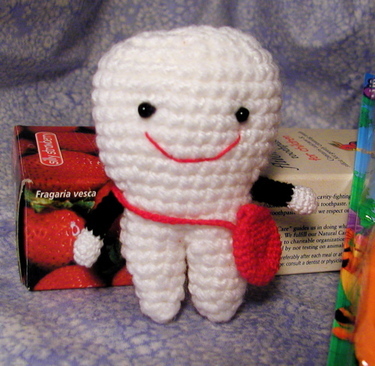 One of the things I'm helping to make for the Elves' Corner (handcraft sales) at Max's school's Winter Faire. 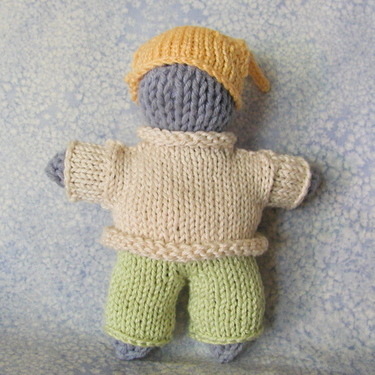 For scale, he's about 2.5 inches tall and all hand-sewn. Two more birthday parties this past weekend = more tote/book bag sewing! And I've finally managed to get a bit ahead of the birthdays, so there are two extra book bags for sale in the shop: the apples & pears one, and one of the chicken ones. If you mention that you came from my blog, I'll include free personalization, either by chunky letter beads on a ribbon tied around the handle, or by stamping onto twill tape and sewed onto the back of the bag! One of the birthday parties this weekend had Vera the balloon lady (a local celebrity). What fun! 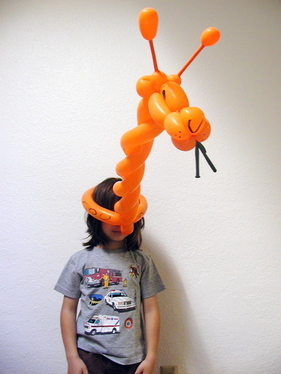 She made balloon hats for almost everyone, children and adults. It was a game, you couldn't watch as she made the hat but could ask yes/no questions. And then you couldn't look at what was on your head until you guessed correctly. Some were pretty easy, she did those for the kids. For the adults, some were quite difficult. Like the martini (way to go, Eve! ), the alien, and the devil/angel cross. 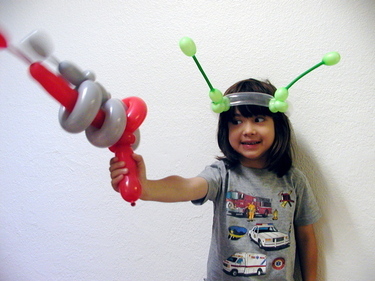 Below is Max modeling his snake (he asked for something scary), dad's martian with ray gun, and my giraffe. What a topic. So many possible interpretations. Journey from childhood to adulthood, from there to here, journey toward being a mom. I played around with this in my head for quite a while, and then this morning I found myself awake at 5am, mentally arranging little bits of paper. After trying to get back to sleep for half an hour, I finally gave up, cleared off the table, and went to work. The underlying layer is vintage graph paper, rescued from the trash bin at my husband's work. It seems that no one uses graph paper anymore. I don't use it professionally, but still I love it, always have. The evenly spaced grids, the slight see-through-it-ness of it. 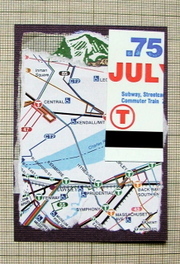 Above is a piece of a map from the MBTA subway system in Boston, the T. I went to college in the Boston area, and the T was a huge part of my life. Mostly unconscious, but always there. Where to live to be close to a T stop, preferably on the red line so I could get to school without having to change lines. When was the last train? How to get to the airport? How to get anywhere? Which stations should you avoid late at night? I went to undergrad and grad school at the same place, and for all but a year of that time I was car-less, and so entirely dependent on the T.
At the top is a little piece of a mountain, for my current home. Torn from a flyer for the county fair that we went to this weekend. And on top of it all is a portion of a T pass, from 1991. I have a stack of these, I don't know why I saved them, but I did and finally I found a use for one of them. 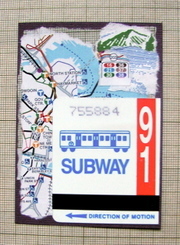 This is my second attempt at an ATC, my first is here. This is definitely a stretch for me, both because the space is so small, and also because I'm not used to creating this type of art. I think this is a wee bit more involved than my previous one, but still it seems kind of plain. Oh well, it's all a journey, right? This time I made an extra for me to keep. Same basic idea, slightly different arrangement. What a cutie Tootie! Thanks a bunch Myra!